Before you hit the gym, you might want to equip yourself with a bottle of water and proper gear. Especially if you’re weightlifting, a pair of best workout gloves is a must. It is to prevent your hands from swelling and getting blisters. Workout gloves are also designed to help you gain full control when lifting something heavy. It adds more to your strength. The right pair of workout gloves will let you handle all kinds of weightlifting activities in ease. Now, if you are planning to buy yourself a pair, you will see plenty of choices online. That’s why we narrowed down the available options for you. The Harbinger training workout gloves are made of 100% fiber. It features a built-in wrist wrap that helps to keep the stability of your joints when lifting. Aside from that, thanks to its articulated TechGel padding, it provides more flexibility that can maintain the gripping sensation when lifting weights. It works to provide optimal comfort in the process. It has ½ finger-length that can improve your grip and vented design to avoid moisture in the process. Its wrap-around thumb protection, on the other hand, works by protecting your thumb using leather. It can also resist abrasion. Make sure that when measuring, you do not include the circumference under your thumb. The manufacturer offers a 90-day warranty upon purchasing the product. When it comes to workout gloves, a pair made of leather is heaven to your hard-working hands. 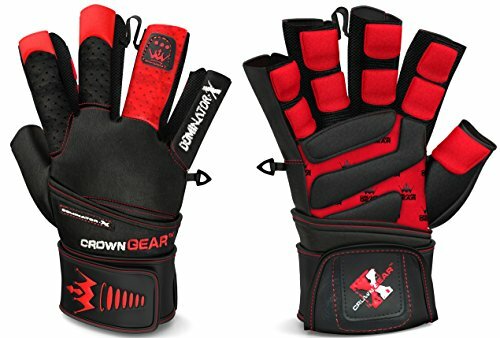 Check out the Crown Gear workout gloves. It is made of soft leather and has double stitching, ensuring you that it can last for a long time with proper care and maintenance. The Crown Gear dominator gloves can help to improve one’s grip when lifting weights. It can also prevent moisture caused by sweating and lessen your risks of accidents inside the gym. Thanks to its four-way stretchable fabric, you can improve your mobility and multi-directional stretching. The EZ pull-off system allows you to remove the gloves easily after working out. One good thing about this workout gloves is that they don’t only offer protection to your hands. It can also help you to work beyond your own strength. And the fact that it’s padded will rid you of worries about calloused and swelled hands after every workout. 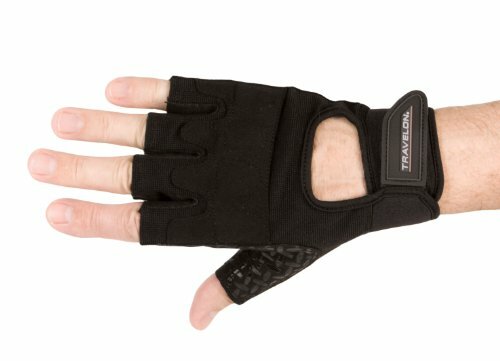 The Travelon all-purpose gloves can be used for weight-lifting, kick-boxing, driving, and even when doing your garden. It has an adjustable wrist closure for your convenience. Aside from that, the cushion in the palm area is extra thick and can resist abrasion. Its silicone patches can reduce the fatigue you feel in your hands when doing strenuous activities. Its open finger design will allow you to gain full control of what you’re lifting. The fabric is fresh and airy. Rest assured that no matter how much you sweat, your hands will remain dry and protected for improved work. Its efficiency is not only limited inside the gym but can also be worn and used in a variety of chores. 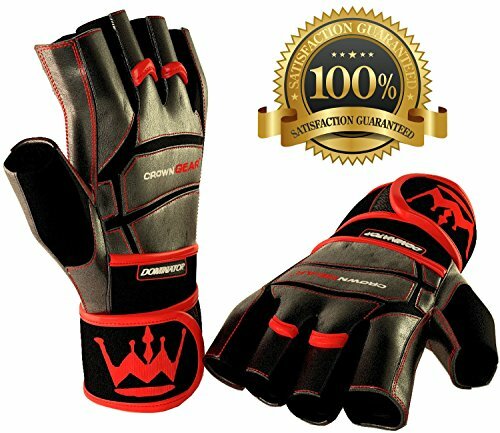 Another product from Crown Gear, we have these workout gloves designed explicitly for weight-lifting and bodybuilding. It provides exceptional grip and control for a better gym performance. Thanks to the molded padding for palms and fingers, you can avoid moisture and decrease risks of being injured. Due to its thickness, it may also help you to improve your own grip strength. The breathable soft premium leather and four-way stretch fabric provides the flexibility that you need when bodybuilding. Aside from that, the perforated leather gives you the ventilation that your hands need. The Dominator X workout gloves are ideal especially if you have sweaty palms. It does not cause any discomfort even when worn for a prolonged time. The three-dimensional fit system and built-in wrist support make it more convenient. It has a pull-off tapping system. It’ll only take a few seconds for you to remove the gloves after it’s used. 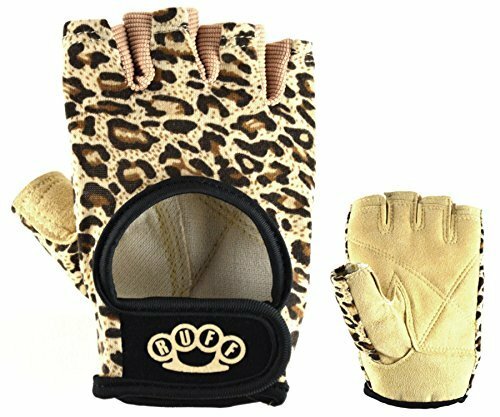 The Ruff leopard workout gloves are designed for women’s use. These printed workout gloves are not just stylish, and it helps to eliminates blister problems and callous to your hands when working out. It is made of Japanese Amara synthetic leather that can resist mold and fungus in the long run. So you’re most likely to expect that the leather will stay dry and cool no matter what the circumstances. Aside from that, rest assured that this is 100% eco-friendly. Despite its animal print, no animals were harmed in the making of this pair of workout gloves. The Spandex joints give you flexibility, and the leather is breathable. It is double-stitched, adding to its durability. This pair of workout gloves is an idea to use when doing yoga, weight-lifting, and bodybuilding. For your assurance, the manufacturer offers a 100% money-back guarantee if you are not satisfied with the product. Another product from Harbinger, this padded leather workout gloves might be the one that you are looking for. Its ergonomic design and thick padding are built for all-around training and lifting. The patented wrist-wrap will keep your wrist stable to avoid possible injuries while training. It also features TechGel comfort wherein the pads will follow the natural contour of your hands. In that way, you can enjoy optimal comfort and flexibility when working out. Due to the thickness of its pads, it serves as a protection of your hands from abrasion. 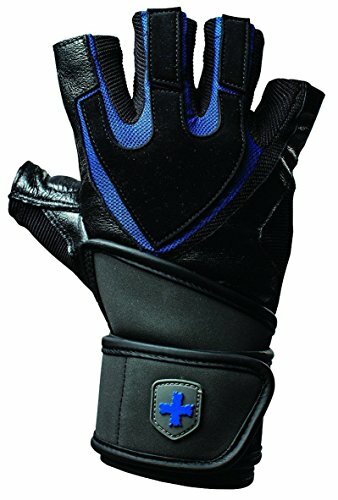 The extended fingers of these workout gloves maximize the hand protection you receive when wearing the pair. Take note that this pair of gloves is not suitable for machine-wash. This sleek-looking workout gloves from Fitness Mad is designed for men’s use. 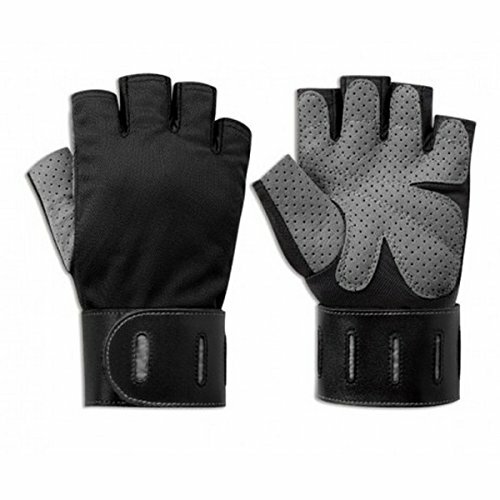 Thanks to its superior durability, this pair of gloves is ideal for weightlifting and strenuous activities that you engage yourself of. Aside from that, it has a leather palm with soft padding that offers extreme comfort and improves your natural grip. On the other hand, its half finger design features pull-off tabs that make it easy for you to remove the gloves after working out. The two-layer stretch spandex back is breathable and can reduce moisture. Best of all, you don’t need to burn a hole in your pocket to own this pair. It is sold at an affordable price. The Body Sculpture aerobic gloves are designed for a variety of aerobic and weightlifting exercises. You can also use this for outdoor leisure cycling. The gloves feature a removable wrist protector that provides ultimate wrist support. The gloves are made of high-quality synthetic leather, polyester, and PVC. Rest assured that with proper use and maintenance, it can serve you for years to come. While it may not be the cheapest pair of gloves we have on our list, it offers superior durability and comfort. The thick padding of the gloves can help to improve your grip and prevent incidents from happening. Since it is made of leather, we suggest to hand-wash the gloves for maintenance. 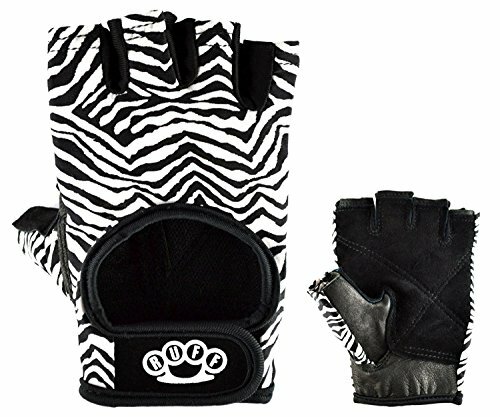 The animal print of the Ruff zebra weightlifting gloves will surely catch anyone’s attention. It’s stylish and durable. 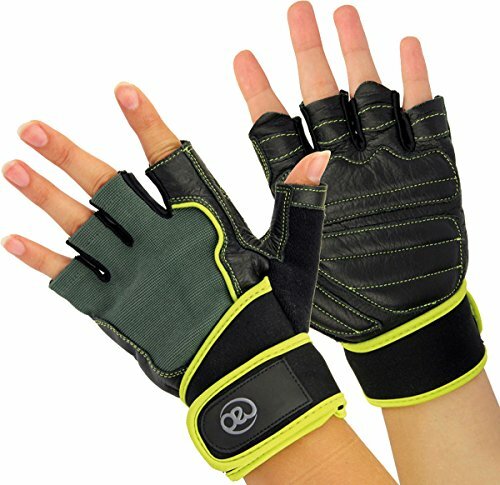 This pair of gloves will keep your hands protected while doing strenuous exercises inside the gym. The zebra spandex is airy and breathable, allowing you to avoid moisture and sweat buildup in the process. The gloves provide extreme comfort with its thick padding. It is also easy to put on and take off. You can refer to the manufacturer’s sizing chart to choose your correct size. The manufacturer offers a 100% money-back guarantee if you are not satisfied with the quality of the product. Now you can buy with confidence!